Last updated 14 October 2000. Reasons for the delayed international impact of the jembe are varied. Weak ties and language differences between the U.S. and the former French colonies in which the jembe is indigenous are responsible for the late migration of Francophone West Africans to North America in significant numbers. The death of Guinean President Sekou Toure in 1984, after two and a half decades of strong patronage of the arts and increasingly severe repression and international alienation, opened the doors for foreigners to visit, and also forced some Guineans to look abroad to fill the void left by sharply reduced patronage. 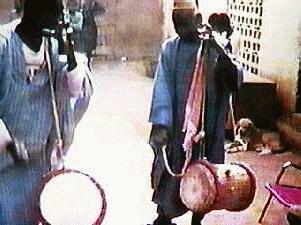 Shortly after the Sekou Toure era, Guinean drummers Mamady Keita and Famoudou Konate had established themselves in Europe. Les Ballets Africains (which became the national ballet of Guinea after independence in 1958) began releasing CDs through European management. A group of drummers primarily drawn from Ballet Djoliba (established in 1965 as a second national ballet in Guinea) began touring and releasing CDs as Percussions de Guinee (established in 1988 as a national ensemble), also under European management. A recent tour with ex-Police drummer Stewart Copeland contributed to their renown. The world music boom, begun in the late 1980s and showing no signs of letting up, is also a significant factor, with organizations such as WOMAD in England producing tours including jembe -based groups such as Fatala from Guinea and Farafina from Burkina Faso. Mass interest in the jembe has not been accompanied by serious information on its use in its African homeland. Misconceptions about the instrument abound. Basic questions such as who plays the instrument, on what kinds of occasions, in which countries, and in what kinds of ensembles are ill- understood outside Africa. Few non-native jembe players have spent significant amounts of time in Africa to see how the jembe functions in the environment in which it flourishes. African jembe teachers living abroad try their best to communicate the depth of the instrument to their foreign students, but aside from the classic problem of interpreting a foreign culture, there is another more basic problem: language. Even spelling is cause for confusion. Since most African languages have no indigenous writing system, European scripts have been adopted. The English j sound is represented in West African French writing as dj , di or sometimes dy . The English long u sound is written as ou in French. Non-African-language speakers put a European or American accent on some of the French spellings that can further corrupt the African pronunciation. Such is the case with the rhythm spelled Mandiani in French, and sometimes mispronounced Man-dee-ahn-ee by English speakers. The French spelling djembe has been accepted by a public unaware of the colonial legacy implied in such a simple matter as spelling. It is not a French instrument, but an African one. Africans and non-Africans alike are developing systems for writing Bamana and Maninka using phonetic spellings rather than the ornate French that harkens back to the colonial era. The simplification of French spellings such as djembe, Mandiani, and Doundounba to jembe, Manjani, and Dundunba, addresses this problem while promoting African pronunciations. Rhythms from regions far apart, which would not mix in a village context, were combined in rapid succession in long suites for ballet performances showcasing the variety of music and dance found in a single country. Instruments that were rarely played together were combined in national ensembles. The forces behind these syntheses were often those who were exposed to European education and culture. The naming of regional and national groups as Ballets , Ensembles , and Orchestres , reflects this European influence. The task of the ensemble and ballet leaders was to retain the African essence of the music and dance traditions, while moving them onto the stage. A new genre was created in the process. There is very little writing about the jembe and its native environment, but surely that will change in the wake of the flurry of recordings. The few books that have been written each demand a critical eye to put them in perspective. One book (Diallo & Hall 1989) is written by a Malian of Minianka origin, on the periphery of the core tradition. Another autobiography (Drame & Senn-Borloz 1992) has yet to be translated into English, and it reports on traditions in Burkina Faso and Ivory Coast, also removed from the core Malian and Guinean traditions. These books are co-authored by writers with little musicological experience, so they lack that perspective. The transformation in the U.S. of a Senegalese drumming tradition--which actually is a transformation of one from Guinea--is covered by Mark Sunkett (1995). A booklet accompanying a Famoudou Konate CD (1991), written by his student Johannes Beer, provides a musicological introduction to jembe rhythms (in German and French only), as does a French book by a student of Adama Drame (Blanc 1993). A musicology Masters thesis by Rainer Polak in progress at the University of Bayreuth, based on research in Bamako, should continue to open up jembe playing to the kind of detailed rhythmic analysis that has been standard for drumming from Ghana for the past two decades. Just as certain surnames are associated with numus there are surnames that are associated with jelis, most notably Kouyate and Diabate. There are also family names that indicate noble non-artisan status--called horon --such as Keita, Konate, Kone, and Traore. Members of the horon class were the former warriors, rulers, and chiefs of Maninka society. Family names in West Africa are often reliable indicators of ethnic and class origins, although there is much fluidity in West African society so caution must be exercised in making generalizations. Nevertheless, the vast majority of jembe players have Maninka or Susu names, with many of them belonging to numu lineages such as Camara, Doumbia, and Kante. Most of the other names of jembe players, such as Keita and Konate, are of Maninka horon heritage. Very few of the names are of jeli origin. While jelis in core Mande areas recognize that the jembe is not one of their instruments, in more distant areas this tradition may have been transformed, hence Adama Drame's assertion that the jembe is a jeli instrument in Burkina Faso. Jembe repertories draw from many different sources. There are widespread core Maninka rhythms and dances such as Dundunba (one of the most widely recorded jembe rhythms), as well as more geographically limited dances such as Soli (Maninka of Guinea), Dansa (Xasonke of Mali) and Sunu (Bamana of Mali). Many other rhythms played on the jembe are adaptations from other kinds of drums played by neighboring ethnic groups within single countries, such as Kuku from the southern Guinean forest region, which is popular in Guinea, but unimportant in Mali. Despite the impression left by large numbers of students in classes taught by jembe teachers and the numerous accompaniment patterns circulating for any one rhythm, jembe ensembles in Africa are small and the number of accompaniment patterns used are equally limited. Recordings range from solo jembe with no overdubbing (Adama Drame 1987), and solo jembe with one dundun (Ladji Camara n.d.b. ), to ensembles of up to four or five jembe players (Percussions de Guin�e, Ballets Africains ). A minimal ensemble would require one accompanying jembe , one lead jembe , and one dundun . Typically two or three dunduns are used, including the medium-sized sangba , and the small kenkeni . A standard ensemble, then, could comprise two jembes and two dunduns (Mamadou Kante 1994), two jembes and three dunduns (Mamady Keita 1989, 1992; Famoudou Konate 1991), or three jembes and three dunduns (Adama Drame 1994, Mamady Keita 1995). Three is usually the limit for dunduns, but any number of jembes can be added, often doubling parts. Any more than two different accompanying jembe parts, though, are probably creations of the leader. The wave of recordings released to a welcoming public outside Africa contrasts starkly with local African preferences. In Mali and Guinea the local music industry has released hundreds of cassettes of traditional and modern music to an adoring public, but one genre of music is conspicuously absent: drumming. There are virtually no local cassettes of jembe drumming available. Drumming is not for listening; it is for dancing. 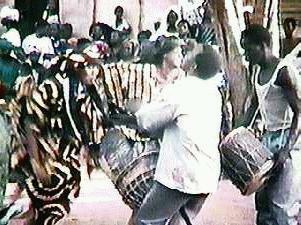 The dances done to jembe drumming are communal events requiring live drummers. Jembes are sometimes heard as part of urban popular music groups, but they usually have a background role, except during rare solos. When jembes are called upon in this context it often is to evoke the more spiritual aspects of dancing as in Oumou Dioubate's (1993) haunting piece Lancey where she describes a pact she made with Allah (God) after losing her twin infants. If Allah would grant her the ability to bear a child who could survive to call her 'Mommy' she will do the sacred Moribadjassa dance. She gives birth to Lancey and when she hears him call her, she calls upon the women of the world to help her dance the Moribadjassa . Enter the jembe . Jembe bibliography , discography , and videography.